Welcome to Shaugnessy. If you live here, you have made it. Easily the most prestigious of Vancouver West neighbourhoods, Shaugnessy is amazing. Random curved streets just wide enough for a couple cars, massive homes with huge lots and plenty of old grow trees. It really is something to just drive around this area. 16th and 41st Avenues act as the north/south border, with Cypress St. and Oak Street framing on the West and East. This area was developed by the Canadian Pacific Railway as an area for the homes of its executives. 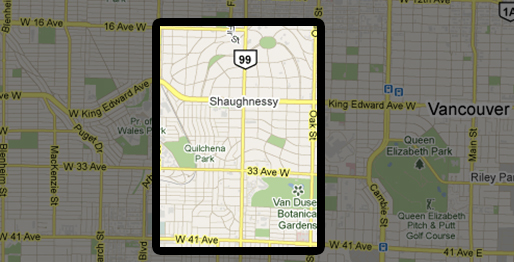 Today Shaughnessy boast large gorgeous homes, sprawling lots and upscale shops that cater to the prosperous citizenry. In this district you have two secondary schools: Vancouver College, York House and two elementary schools: Shaughnessy Elementary and York House Elementary. One of the main attractions in this area is the VanDusen Botanical Gardens located on 5251 Oak Street. The gardens are home to an amazing winter light tour and a fun for the whole family hedge maze, not to mention the obvious beauty of the gardens themselves.